We’re down to four teams on The Amazing Race, which means that each team has a 25% chance of winning a million dollars. Okay, we know that’s not quite true, but it’s fun to pretend, right? Uchenna & Joyce, aka Team Chrome Dome, leave the Jodhpur Pit Stop at 11:24 p.m., in first place after using the last Fast Forward of the race. Right off the bat, they’re on the move in a big way, to Istanbul (not Constantinople). It’s a rare case of a major trip westward, and it also brings them to Europe for the first time in the race (Istanbul being on the very edge of it). The next clue is on top of a tower on an island in the city. At this point, we get to see the great lead that this maneuver and sacrifice on Joyce’s part didn’t give them, as they are only two minutes ahead of both Ron & Kelly and Rob & Amber, who arrived simultaneously in second and third. Some strategic advantage that turned out to be. Rob & Amber (with Sanjay still in tow) clearly don’t have that problem, obviously, as their upcoming TV wedding special (they’re our generation’s Tiny Tim & Vicki!) indicates, although this is probably due to Amber doing whatever Rob says. It’s devilish in its simplicity. These two teams are working together in a loose alliance still, but Rob shows no compunction about throwing Ron & Kelly under the bus (literally? Perhaps.) should it come to that. Meredith & Gretchen leave at 11:33 pm, or just nine minutes back of first place, by far the closest they’ve been to the lead at a Pit Stop. That deal they struck with Imhotep seems to be finally paying off. All four teams are on the road and headed to a travel agency (apparently, all-night travel booking is one of those must-have services in India), although Uchenna & Joyce stop off at a hotel to call first, finding the fastest flight is at 10:20 the next morning. Ron & Kelly and Rob & Amber book the same flight after reaching the travel agency, as do Gretchen & Meredith, meaning not only that we have another bunching point, but Uchenna & Joyce lost their lead for no good reason (albeit with no consequence). They’re going to have to become more confident to win. Gretchen appears to have some fire in her belly, and doesn’t seem to be settling for just staying in the race anymore, telling Meredith to hurry it up. I’d do what she says at this point, fearing for my eternal soul. Ron & Kelly and Rob & Amber reach their hotel for the night, and bidding Sanjay a fond adieu, never, it seems, having actually learned his name. Ah, the banner wavers of the culture. The next morning at the airport, we get Meredith & Gretchen taking over for Lynn & Alex in the Rob & Amber locator function – I’m beginning to think they’re getting directives from the producers a la Itchy & Scratchy and Poochy. There’s also some gamesmanship from Rob, who asks Gretchen if they got on the “earlier flight to Turkey”. While it’s slightly clever and does manage to rattle both Team Ooooold and Team Chrome Dome, if they stopped and thought about it for a couple of seconds, they should realize that he’s bluffing. For one, why would he tell them about it, and two, they didn’t have any basis of comparison for “earlier”. Ask Rob one question, “what time is that one leaving?” and the whole complicated ruse falls apart. Just try a little, that’s all I’m asking. However, this little comment may have backfired on Rob, who has already gone through the security gate. Borrowing a cell phone, Uchenna does in fact find a flight that arrives earlier, albeit with a connection. Rob is not content to sit still however, and when they land in Delhi for their first connection, he sets off in search of a faster flight himself. Ron & Kelly have an… interesting conversation in their cab on the way to a travel agent, where Ron declares there’s more to life than settling down with a beauty pageant winner. One thing’s for sure, the boy has self-confidence. Kelly says she’s not going to wait for him and questions his commitment to… well, everything. Ron comments that sure, it looks bad if you don’t count committing to the Army when she drops the bombshell of saying he got out of that by being a POW. This is so ridiculous that Ron doesn’t even bother getting angry -- “I almost died… but I knew I’d be getting out of the Army early,” he says, blowing out fuses in sarcasm detectors across the continent – and Kelly just sits smugly wondering if she’s won her million dollars yet. Meanwhile, Uchenna & Joyce and Meredith & Gretchen have found their faster flight, arriving at 6:30 the next morning, while Rob & Amber and Ron & Kelly are fed bad information and stick with their direct flight that arrives at 8:30. If you’re wondering how much is too much gamesmanship, this is it. Strengths: Determined and focused on the race. Their teamwork is second to none and is only getting stronger. Uchenna is the physically strongest player left in the game. Weaknesses: Prone to wandering off the map, and make an appalling number of mental errors per episode. Have no particular sense of strategy and generally too reliant on other teams for information. Strengths: Make very few mistakes and arrive at decisions relatively quickly. Ron appears to be virtually unrattleable. Weaknesses: Relationship disintegrating faster than the Antarctic ice shelf. “Quick decisions” are generally to do whatever Rob & Amber are doing, which virtually guarantees that they’ll constantly be behind them. Strengths: Intuitive and complete understanding of game play. Willing to use anyone in any fashion, at any time, for any reason. No bickering, just about ever. Extremely resourceful and their residual fame has helped them more than once. Weaknesses: Ridiculously confident in their abilities, to the point of over-confidence. Get flustered and defensive when not in the lead. Amber appears to bring a big fat zero to the table, although takes nothing off it. Have burned almost every bridge with the remaining teams. Strengths: Uncanny ability to capitalize on other teams’ mistakes. Uh…Gretchen’s voice could shatter glass if it came to that. Possible latent mutant powers. Weaknesses: By far the weakest team physically. Seemingly no concept of how to perform tasks. The opposite of hawk-eyed. The team most likely to fall into a crevasse and be eaten by wolves. Meredith & Gretchen and Uchenna & Joyce arrive in Istanbul with their two hour lead and set off to find the ferry to the next clue box. Although the editing may be misleading, it appears that Rob & Amber and Ron & Kelly arrive in Istanbul before they reach the clue box. Rob & Amber take a tiny lead by getting to a train first, leaving Ron & Kelly in last place. The next clue is to search the island they’re on (which is basically big enough for the one building) for garden gnomes, helpfully provided by Travelocity. Gosh, I just realized that this is their advertising mascot. What an incredible coincidence! The bonus prize for this leg is connected to this task, as the team that picks the gnome with an airplane symbol on the bottom will take it if they bring the gnome to the Pit Stop. Once they get a gnome, they have to then find a castle in Istanbul, which has the next clue box. Gretchen finds a gnome almost instantly, which puts them in first place… sorry, just waiting to see if the world was going to implode if I said that. Joyce spots one shortly after and both teams get on the same boat back the mainland. No word if either has the prize winner. The potentially Earth-shattering lead does not last long, as Uchenna & Joyce beat them to the next clue box, which is the Detour. The first choice is to search an underground well with marked columns and then use the numbers to unlock a chest. The second choice is to weigh enough people to total up to 2500 kg (or 5500 lbs). This would be really quick if they were in Vegas. Uchenna & Joyce choose the weighting option, which seems easier than searching through the maze of columns in the well. Meanwhile on the way to the clue box, Meredith decides to name their gnome, calling it “Jerome” (after Gretchen helpfully offers “Gnome”). Still under the impression that they’re in the lead, Rob & Amber make the next ferry to the island, while Ron & Kelly are still on the train out to it. This cements their position for now, but Rob doesn’t want “to overdo it”, which is probably the first time he’s ever had that thought. Uchenna & Joyce are now involved in the process of hassling random Istanbulians (Istanbulites? Istanbullies?) for the weight, and employing the time honored tactic of English in a Vaguely Foreign Accent. Reaching the castle, Gretchen insists on climbing it, bypassing the easily accessible clue box on the ground and wasting valuable time. Confounded by modern conveniences like elevators (although admittedly, I’d wonder what “Z” is too), they eventually realise their mistake and head back down. At this time, Uchenna & Joyce are finishing up their task, and are on their way to the next clue box, located in a medieval fortress. Hopefully their current lead gives them enough “getting lost” time for their needs. After a second trip to the top of the castle, they spot the clue box at the entranceway (seriously, they could have stumbled over it) and choose the weighing option. It’s on the ferry over the island that Rob & Amber get their rude awakening, finding out they’re in third place (though not really as far behind as what they might think). Although Rob has apparently lived his years on the planet without running across a ‘guh-nomee’, Amber knows what they are (yay! contribution!) and they’re off to the next clue box. Ron & Kelly take the last of the gnomes, and seeing the empty clue box, also realize they weren’t in the lead pack. Rob & Amber have found a water taxi to the castle and the placing will depend on if this is faster than the land route. At the fortress, Uchenna & Joyce find the clue box, which contains the Roadblock. Sponsored by The Princess Bride, it’s all about storming the castle, which is an easy choice for Uchenna. After climbing a rope ladder, he must then find a key and then rappel down the side of the fortress. The physical part of the task proves no challenge for him, but the mental? That’s a bit more challenging as he stares blankly around looking for the key, which is directly in front of him on the wall. Still on the Detour, Meredith & Gretchen start to wander around looking for a man with scales. On par with Rob never having run across a gnome, Meredith may never have come across a scale, and I’m starting to think Gretchen is looking for a man with skin like a snake. How do these people find their way home at night? Meanwhile, Uchenna has blazed through the Roadblock after finding the key. He and Joyce are on their way to the Pit Stop, which is somewhere inside the fortress. Bucking the odds, they get there without becoming lost, and are in first for the second straight leg. It's a very strong leg from these two. They do not have the prize-winning gnome, but they do have what appears to be a huge lead. After finally finding the man with scales, we are now treated to the sights and sounds of Gretchen & Meredith yelling at passing people, and casually insulting them by implying fatness. Rob & Amber have reached the Detour and choose the scales option. Not too far behind them, Ron & Kelly have found the castle, but make the same mistake as Meredith & Gretchen, going up to the top. In the parlance of Brad Goodman, these two are stuck in a Blame Cycle, which causes Kelly to more or less give up, passive-aggressively sabotaging their chances. Ron seems to think, “Finally, we’re doing things my way!” They choose the columns task, the only team to do so. Choosing not to fight in front of the money, they make up slightly to work together in this task and possibly make short work of it, though we will have to see if they’ve found the right combination on their first try. Meredith & Gretchen reach the fortress and send Gretchen up the wall, with personal injury lawyers rubbing their hands in glee. Wobbling on the rope ladder, she realizes this may have been a slight tactical error. Rob & Amber have successfully worked the crowd and gotten their 2500 kilos, and move on the fortress, where they may be able to catch up. After a few tries, Ron & Kelly have found the right code to the lock box, and are also on their way. Slowly working her way up the wall, Gretchen eventually reaches the top, and continuing the theme of the episode, stares around a bit before finding her key. After the slowest rappel in history, Gretchen completes the Roadblock. Meredith & Gretchen then make it to the mat in second place, the first time in the entire race that they’ve finished in the top half. They also do not win the prize, but the fact that they’re still standing counts for a lot at this point. Gretchen believes that their success on this leg was due all to their own efforts, and while she’s right to a point, it was Rob’s offhanded comment and Uchenna’s search for plane tickets that put them in this position. They still have to show some initiative of their own. On the other hand, they're in second place, and could still win this thing. Look, it's fun and all dragging your corpses around the world, but enough's enough, okay? Rob is working quickly through the Roadblock with Ron not too far behind. After reaching the top, Rob does what no other team has done so far - finds the key without a lot of pointless searching. Down at the base of the castle, there’s an oddly awkward exchange between Amber and Kelly, consisting solely of “Hey.” I’m really not what the point of that was, unless it’s to highlight the sum of their contributions to their respective teams. Rob rappels down the tower and completes the Roadblock, and Rob & Amber make to the Pit Stop in third place. In what I think is a first, we can see Ron still performing his Roadblock over their shoulder from the mat as he stares goonily, looking for the key. Hint: it’s probably not on the horizon. Rob & Amber's gnome does not contain the plane symbol, which, by process of elimination, means Ron & Kelly’s does, if they still have it. Ron & Kelly both know they’re last at this point, so the only question remains whether this is a non-elimination leg or not. It is, as there usually is when there’s four teams left, and they are still in the race. They then get mugged by Phil – c’mon, it’s not their fault you didn’t pack – and lose everything but the clothes they’re wearing and their passports. 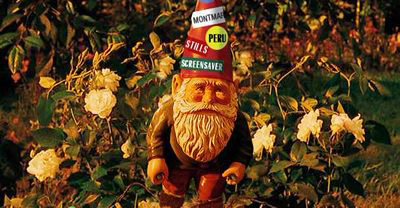 They have brought the gnome however, which is good for a prize of $20,000 to spend on Travelocity. Good thing that’s splittable. They also get to spend the night in a four-star hotel, but I’d definitely watch for these guys to be stealing towels.